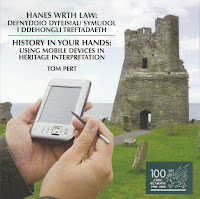 The Royal Commission on the Ancient and Historical Monuments of Wales (RCAHMW) has published a bilingual booklet on using mobile devices in heritage interpretation (see press release). The report is by Tom Pert, the mapping officer for RCAHMW. The final three sections deal with Provision and Maintenance; Future Directions; Broadening the Application - the Value of Mobile Devices. I was also pleased to see a section on accessibility including the use of mobile technologies 'where physical access to a site or landscape is problematic for a user'. There is a section on multi-media software (Windows) used to produce the resources. (Mac users will find that they already have the resources they need to create podcasts.) I was a little surprised to see that there was no apparent discussion of RSS feeds for podcasts. There is a useful bibliography and list of websites (though a single online page of links from the RCAHMW website would have been even better). We now hope other historic landscapes, in town and countryside, can be opened up in a similar way to Ruthin and Blaenavon, marrying the latest technology with tangible sites on the ground, and so to extend our public spaces that are both safe and fascinating for youngsters and adults alike. The Royal Commission stands ready to do so along with partners, be they communities or businesses, schools, colleges or universities, or the museums, archives and libraries linked to them. It couldn’t be more appropriate that the first of the Commission’s publications in this, its Centenary year, should be on a subject that looks ahead into its second century.